Each of the burners below have a rating of 15000 BTUs. These low pressure propane cookers are great for camping, hunting, or at home for that extra pot. Three types of cookers are available to fit your needs. 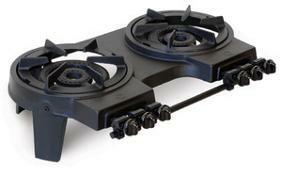 Each of the heavy duty burners has a rating of 35000 BTUs burner. These low-pressure propane cookers have three adjustable valves for each burner to give you perfect control of the amount of flame needed. Perfect for those times when more BTUs are required.